Andrew realised he wanted to be a chef from an early age, after winning a host of junior competitions in his early teens, at 15 he was given the biggest opportunity when he caught the eye of legendary chef Anton Edelmann who offered him an apprenticeship at The Savoy. After 3 years Andrew decided that he wanted to expand his training so he moved to France and took up residence at The Chateau de Remaisnil in Picardy to perfect and develop his style. From there he moved on to a season in Les Deux Alps, then on to the Michelin starred Chateau de Montreuil, where he stayed until he returned to the UK. He then accepted the offer to join Gary Rhodes and his team The Greenhouse in Mayfair. At just 21, Andrew saw an opportunity to open his own restaurant in his home-town of Rochdale, and he took it – Nutters was born. After a few very busy years, the restaurant had really made a name for itself, and so had Andrew. His outgoing personality, teamed with a vast knowledge of his field and an infectious passion for modern cuisine soon caught the eye of TV producers and his screen career began. Over the last two decades Andrew has been a familiar face on our screens – beginning with his own TV Show – Utter Nutter, which combined cooking with guests – including the Spice Girls and Judi Dench. He was a regular chef on Ready, Steady, Cook, and he was the resident cook on Lorraine & Afternoon Live, plus a host of guest appearances on many prime time shows. In recent years Andrew has been in demand all over the world, appearing at events from Dubai to Dublin, and working in conjunction with a wealth of well known brands and companies. 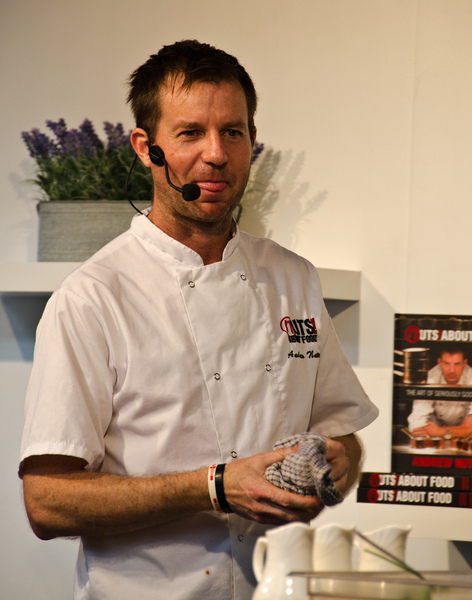 Andrew has published two books of his own, Utter Nutter & Nuts About Food, as well as contributing to dozens of others, and is a regular guest writer for the Manchester Evening News, and is also a frequent guest on BBC News for his culinary expertise. Andrew was also incredibly honoured to me named Rochdale Man of the year 2015. He was humbled to be recognised for all his efforts to promote and champion the region at every opportunity, and all his work with community to encourage youngsters to get involved with cooking. Earlier this year Andrew had the honour of working with HRH Prince Edward at an event celebrating the 60th Anniversary of The DofE Awards Scheme. In most recent news Andrew has opened his second Restaurant in Rochdale, The Bird At Birtle to rave reviews.